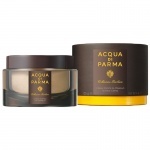 Acqua Di Parma Shaving Deluxe Stand is a shaving collection with a distinct and elegant style that is refined and elegant and suitable for even the most discerning of tastes. The perfect gift for someone or your self, Acqua Di Parma Shaving Deluxe Stand combines the most exquisite and elegant of materials for a piece of luxury whilst you shave. Acqua Di Parma Shaving Deluxe Stand is attractive to look at, an object of desire with a wenge wood handle and pewter-resting stand. It is a perfectly aerodynamic piece of shaving equipment that is weighted to allow your hand to glide into the contours of your skin and neck, for a wonderfully easy shave that looks and feels fabulous. Acqua Di Parma Shaving Deluxe Stand allows you to gain a professional look in minutes, whilst also maintaining an elegant and envious look to your bathroom shelf. 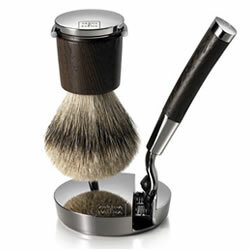 The Acqua Di Parma Deluxe Shaving Stand epitomises al that is stylish and elegant about Italian craftsmanship.